We are longing for a better country – a country of our own. When Abel, Enoch, Noah and Abraham died, all they had was their faith in God. They had not yet seen the promised Messiah. We now know Jesus. His life, death, resurrection and ascension have transformed our lives. Even so, every day we join with these spiritual patriarchs as we long for a country where we truly belong. A country where every knee bows to God. A country completely filled with all of the good things that come from the Father of Light. A country where Satan no longer prowls like a lion looking for something to devour. A country were we can lay down our armor of God because there are no more battles with the Evil one. A country with a Holy and loving and Righteous King. 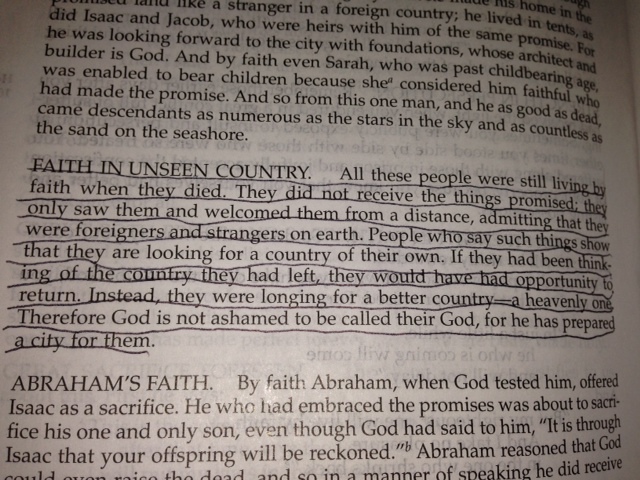 A country wrapped in the loving arms of a heavenly Father. God has prepared this place for us and – someday – we’ll be going home.